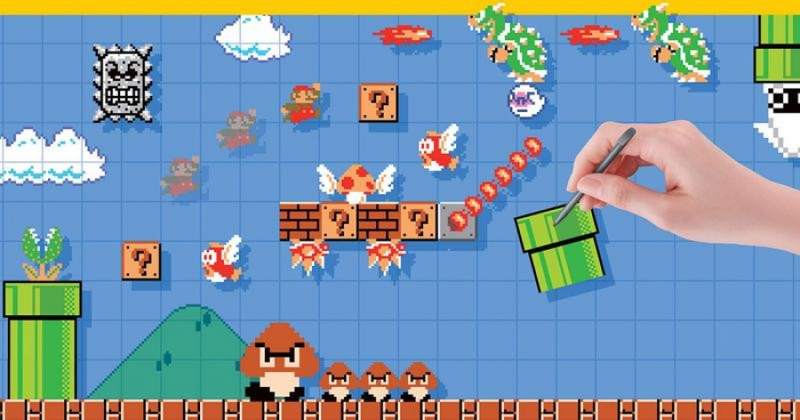 As many of you are aware, a new update was recently announced for Super Mario Maker. The update seems to be fairly meaty; it'll be adding a clown car that can spit fire, bumpers, P-Switch doors, a world record leaderboard, and functionality with the new website. Of course, this is all completely free of charge, and it'll no doubt open the door to brand new types of level designs. Game Informer did a quick rundown of the upcoming features recently, and got a few quotes giving some background on them from Yusuke Oshino, the Director of the game. He first remarked how the fire clown car was added in order to add shooter elements to stages. This is something that hasn't really shown up in Mario games, but they thought it'd be fitting for a more open ended game. We've been inspired by the huge number of courses that everyone has posted. There haven't been any shooter game-like elements in the Mario series to-date, but as Super Mario Maker offers so much freedom, we're hoping that users will be able to make even more worlds for Mario that have never before been seen. As for the new bumpers, they were added primarily to expand upon the jumping mechanics of the game and to introduce an extra level of chaos to courses. We added this item to further expand the jump mechanics of the game. We hope that players will create thrilling, maybe even nail-biting courses filled with jumps. Having said that though, players are free to find their own uses for it. It may be a simple item, but it holds an infinite number of possibilities, and we're hoping players will again find uses for it that we never imagined. As for the P-Switch Doors, they were added primarily to give creators more freedom in the maze like courses they design. We really struggled with this decision right up until the very end. For the people making the courses, not having the outline would be best. On the other hand, for the people playing, if there's no outline, they may not realize they have to search for a door, and won't have any hints where to look. Otherwise, players may be unsure about how to move forward. P Switch-enabled doors are not the most straightforward items to use, and by adding this outline we feel we've given players more options for how they can use the doors to create puzzles. Super Mario Maker is all about giving users as many options for creating courses as possible, and it's exactly because of this we decided to add the outline in. We hope that players will come up with lots of creative new ideas, and make the most of this. What do you think? What are you most looking forward to about the update? What else would you like to see added to the game? Share your thoughts in the comments below. Add? Slopes, add more of the missing ennemies (pokey comes to mind), add more than one sub-level, more (mini-)boss battles (Big Boo from SMW, Boom Boom (SMB3)...). Etc. Blarggs. We need a Blargg themed update. All kinds of blarggs. That's it. I am at this point where I am very grateful and happy about every update this game gets. Sure, what I really want to see, is no less than every single enemy that has been in a 2D Mario game to-date, Desert, Volcano, Ice, Jungle, Beach, Night themes, the ability to adjust the light in a level (like have a completely dark level with e.g. Fire Snakes hoping about lighting Mario the way, you know) and both, a Mario Bros. 2. as well as a Mario Land game theme. Also, a Boss Pack would be nice that features all the Koopalings (shake them to adjust how they act), Petey Piranha, Big Boo and all the other bosses from 2D Mario history). I know, that it won't happen but 1. a guy can dream and 2. Mario Maker 2, anyone? Edit: Oh, and power-ups. Ice Flower, Frog Suit, Hammer Suit, Penguin Suit etc. Basically every item we've seen thus far. Oh, and with the P-Switch Doors, my wish for locked doors has been granted. Now only if you could place the P-Switch within enemies so you have to defeat e.g. Bowser before you can get through the door. I would love to have ropes, rotating platforms, ice flowers, and the ability to send levels to people on my friends list that have the game. Aside from slopes, I'd like SMB2-mode, the SMB3 power-ups, the NSMB power-ups (they can be inter-changable! Tanooki Suit/Squirrel Suit, Hammer Bros. Suit/Blue Turtle Suit, Frog Suit/Penguin Suit), more enemies such as Big Bertha, the ability to add water to non-underwater levels, vertical levels, and sledgehammer Bowser. Super Mario Land had a few shooting levels similar to the fire clown car. Anyway, this game needs slopes, all the power ups and enemies missing from SMB3, SMW, and NSMBU, more level themes, different colored Yoshi's and Koopas with their abilities, Koopalings, other Boss characters from various Mario games, adding water and lava within levels, and the Super Nintendo versions of SMB 1 and 3. Multiplayer might be pushing it, but that would be cool to see. Maybe there could be some SMB2 elements, like being able to pick up plants. And also maybe they could put in secret exits keyholes like in SMW. I feel like most of this should have been in the game when it was first released. @dizzy_boy "the ability to send levels to people on my friends list that have the game." That's the single biggest thing needed for this game. It's been a while since I created anything but once this update arrives I'm going to get back into it.Most of my levels are based around some sort of puzzle but I always felt limited to what I can do.The P-switch door has opened up a lot of possibilities for me. Charging chucks anyone? I love spike pillar traps too. I also find stage height unsatisfying.. I wish we could make them higher. Well, it's good these are in fact free of charge, because there's no way I'd pay extra beyond the base price for this stuff. Update sounds great. The Clown Car seems cool, but in what ways will it be different from Fire Mario in a regular Clown Car? I like the idea of different environments. Ice, desert etc. Night time levels would be good. More power ups from SMB 3 and NSMB. It wouldn't be possible to add SMB 2 levels because this was a different kind of game (different gameplay). The idea with the games it has, is that you can change the template of an existing level and it will only change the graphics and nothing more. The titles included follow the same blueprint. I'd honestly just like a means of putting SMW-style hint blocks in the game. I know people can just make MiiVerse comments, but it would help construct narratives within and between levels. @Raien I'd love a new Mario Land (not 3D Land) the 2nd one was especially great as it at a lot more variety with enemies, world's etc and they played somewhat differently. When the NX launches I'm sure there'll be another NSMB but I hope they take inspiration from Land as NSMB games lack the variety I liked from the older 2D titles. Happy with the updates, and as long as we continue to get evolutions to this game I will continue to be happy. As I've said before: Nintendo could and should have just let us choose a game set: SMB, SMB3, SMW, NSMB, then as each is selected, the tilesets change to suit the game, with most or all of the available assets of each game set. Simple. And it would have been good. @DekuOnion I guess so that you aren't immediately screwed on a shooter-based level if you take a hit and lose the power-up? Oh yeah, and the Fire Clown Car has charge shots! @Nathan But then you wouldn't be able to mix and match the various games' assets within the same level. A replay button. I'm really surprised that no-one has asked for this. How many times have you got the end of a level, and wanted to go back to try out an alternate route or hidden extra? It wouldn't add any bold new features, but being able to click 'Play Again' would save a surprisingly large amount of time, given how long it takes to exit a level, wait for the clear badge to drop, click play, then wait for the intro screen to play. Okay, so it's not like you're kept waiting for minutes on end, but it's enough to mentally remove me from the level, which is the last thing I want if I've got a specific part in mind. Yes, I am "looking forward to about the update," thank you. But in all seriousness, I'm really happy about these updates. Personally, I like these additions better than the concept of slopes. Slopes would be neat and all, but they're overrated. @DekuOnion The shots you fire with the Fire Clown Car go out straight too. @MJKOP If I'm not mistaken those are the Sky Pop and Sub Pop. But it's been a while so don't take my word for it. @Not_Soos I'm pretty sure "What are you most looking forward to about the update?" makes grammatical sense. It's asking, "of everything featured in the update, what are you most looking forward to?". If it were, "ARE you looking most forward to about the update?" instead of "are you looking forward to the update? ", it would be dodgy, but I'm pretty sure it's asking something different. @CTMike I'm glad I'm not alone. Maybe 'Replay Button' will become the new 'Slopes' as the people's choice of things to whine about. It would certainly be easier to implement. My God, i just realised Yusuke Oshino is a Super Mario Maker maker! 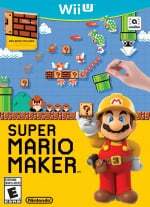 And his parents are Super Mario Maker maker makers! I'm quite glad they added the door outline to minimize abuse by trolls. Seriously, all you need is to hide the door and P-Switch in two obscure areas and you have doomed someone to fail the level if you can't even see where the P-Switch needs to be used. @Jayronauron I was just about to say this almost exactly and then I saw your comment. So, I agree completely. @Danrenfroe2016 @Raien Well, at least the 30th anniversary books (Encyclopedia Super Mario bros. and Super Mario Memorial Book) include both Super Mario Land and Super Mario Land 2 in the titles pertaining to the Super Mario series. The Encyclopedia even has Daisy and Wario in the "main characters" pages! That being said, I'm surprised that Yusuke Oshino completely forgot about Super Mario Land, since even the final fight with Tatanga is in shooter mode! I'd say that the Koopalings are a no-brainer, though Boom Boom would also be nice (and maybe even easier to do than the Koopalings), so if the Koopalings require too much development time, at least him should be in. Finally, slopes are already introduced in Super Mario Bros. 3 and the first stages of both Super Mario World and New Super Mario bros. U use them, so there is a point in having them, both from a gameplay and level design point of view. Of course slopes + ice + penguing suit would open wonderful possibilities in creating DKC-minecart-like levels! "There haven’t been any shooter game-like elements in the Mario series to-date"
So... Super Mario Land never happened? Are there different colour pipes yet? Seems like it would be a very achievable addition. Sure, you couldn't mix on the fly, but that wouldn't be so bad considering the ability to utilize so much more. @NintyMan Couldn't agree more. The NSMB games have become more cookie-cutter with every installment. But they should also introduce a new element to the SMB series that can't be replicated in Mario Maker. You know, so people don't re-create Nintendo's own levels in Mario Maker so they don't have to buy the new SMB title. @Franklin Nope. Differently colored Yoshis would be awesome, too. What's up with the slopes, why is everyone demanding them? I don't see how they could be that important. There are lots of more important improvements for MM if you ask me. But I second @Lebon14, we need more sub-levels. Like 10 maybe (or infinite). Also, I'd like to have another default character than Mario. Like, instead of putting on costumes that you can lose, why not start and finish the level with Link, Wario or whatever character you like? @Jayronauron You can still hide the door with bricks that turn into coins when you activate a P-switch. I disagree, hiding doors and switches doesn't doom anyone if the level is cleverly designed (and if the players aren't completely incompetent). You can still put hints in there, with coins, arrows or sound effects. @Maxz Ehm, there already is something like a replay button? Just hit + and then choose "restart level". Done. @Nathan Nope, that's where you're wrong. Nothing about that would've been simple from a developing perspective. That's a really naive thing to say from a player's perspective. The devs already had a lot of trouble and discussion to make all the modes match each other regarding the tools. So your "solution" would've made things just more complicated. The fire clown car is a great idea. I can make some awesome Shooter levels! And enough with Slopes, they know we want them okay... time to move on. @shani No, after finishing the level, not during it. As far as I know, the option gets removed as soon as you complete the level. The only buttons presently available in the completion screen are 'Star', 'Comment', and 'Exit'. There's no way to start again, directly from that screen, which can be a slight nuisance in such events as: beating the level one way and wishing to try another; missing a secret item and wanting to go back and get it; not getting the score/time you wanted (in point/time based levels); simply wanting the play the level again because it was so splendiferously superb and soul satisfyingly excellent. It's not a big problem, but it neither does it require a particularly big solution; simply a 'Play Again' button on the clear screen. It's a fairly simple request. And I'm pretty sure @dizzy_boy means platforms that rotate on their own axis, i.e. platforms that actually change orientation. Currently we have fixed platforms that can be set on circular rails. They may move in a circular path, but the platforms THEMSELVES don't twist, turn, slant, spin, swivel, gyrate, pivot, 'rotate', or any other twirly word you can think of. What we have is translation, not rotation. Perhaps you could say they 'revolve', but given that the everything remains at exactly the same angle, I don't think we can say that we have true 'rotating platforms'. And I'm pretty sure this is was @dizzy_boy is asking for. No, I'm not wrong. Being able to choose your game set first, you should then have the option of all or most assets from that particular set available to create with. No swapping game set midway through though, without resetting design template (game set). It is simple. "No swapping game set midway through though, without resetting design template (game set)"
That's the whole point! It obviously was most important to them that the user can switch between the sets in the middle of creating the level. So maintaining that possiblity AND giving you the full toolset of every of the Mario games you mentioned at the same time would've been far from simple or maybe even impossible. @Maxz: Ah okay, my bad, I thought he meant platforms that rotate on one shared axis, not on their own. Regarding what you wrote about the missing restart option: I get your point and you're right in that it would be easy to implement. But to be honest I almost never would use it. As far as I remember there was only one single level where I really felt the urge to start it again (which I then did from the level profile). And the reason is simply that there aren't many interesting replayable levels that really reward you for going a different path the second time. @Nathan SOME people are NEVER happy with what they have got. You KNOW FOR SURE it would have been simple to add in the features you asked for, do you? How about giving us a MARIO KART making game, which includes everything from ALL the past MK games, I am sure it would be an easy title to create. Unlike a LOT of DEVS, this is stuff that Nintendo have/are making after the initial game launched. Why not be grateful for what you are getting....FREE OF CHARGE? @akaDv8R Said thought though, is wrong on SO many levels. First of all, a Mario Kart Maker is ambitious as heck, and you shouldn't say it's an easy title to create when you don't know how anything works whatsoever. It would require fast rendering, thousands of tiles, a 3D sculpting tool that almost noone would know how to use. And even if there was, it'd just be dumb square levels that are dumb because, well, 3D sculpting tools are hard to MAKE from a developer point of view, and hard to USE from a consumer point of view. It would also require so many different tiles, like water, rings, pipe bubbles, track start/track finish, mud, off road, sand, grass, rocky, road, decoration of all kinds like pyramids, tall grass, flowers, all that. That isn't easy to MAKE, that isn't easy to USE. Also, these updates are all free of charge. They're UPDATES, not DLC. You start up your Mario Maker, and it updates automatically. You can then use these new elements. What's been annoying me about the slopes issue is that articles like this one, that give us some comments from the development team, have been completely silent on the issue. Is there in fact a problem implementing them into the grid system? Then SAY SO! Just a quick mention that there are technical difficulties putting them in or whatever, so we can turn our attention to things that are more possible. I'm sure more themes are possible, and I'm getting a bit tired of deciding between the same few. As in all the main series games, there are a few different types of more all-purpose "ground" levels, but you only get one here. The other themes are all the more specific types-Ghost House, Airship, Castle. At least rotate in some different music choices for the one ground theme. I don't care about swapping themes halfway through, and it is just a fun little concept to begin with. Nintendo have the ability in their studios to make what I talked about. If indie developers can make Super Mario Bros X, then Nintendo could have made something similar, but much better, and in a shorter time period than them. Of course. @ShadJV I'd be down for that. I love those goofy lava beasts, and the sounds they make when attacking. @CTMike Our prayers have been answered. Rejoice! I'd love to see some of those in Super Mario Maker as well, But alas, It seems that Nintendo is never going to update Super Mario maker again.